Bridgewater, New Jersey - 288 Vroom LLC today is delighted to introduce The Complete Edgar Allan Poe, their slick new eBook reader for iPhone and iPod touch. This amazing collection includes the complete library of Poe's great tales and poems. While Poe was the master of macabre, many of his works included mysteries, satire, and humor, including a few hoaxes that were printed in newspapers of his day. Beyond the tales and poems, The Complete Edgar Allan Poe also includes his only completed novel, selected essays on writing, Stonehenge, even furniture, and more, plus some of Poe's unfinished writing. The Complete Edgar Allan Poe contains a total of over 150 original works by Poe. Besides Poe's great writing, the mysterious looking interface is easy to use. You can read stories in either Continuous or Page by Page mode. Adjust text size on the same screen as the story so there's no flipping back and forth between a settings screen until the text is the way you want it, you will see it as it changes. The app will also automatically bookmark stories as you need them. Plus, the writings are sorted by categories so you will always know what type of Poe work you are about to read. Buy The Complete Edgar Allan Poe for iPhone and iPod touch now for an introductory price of 99 cents before the price goes up. 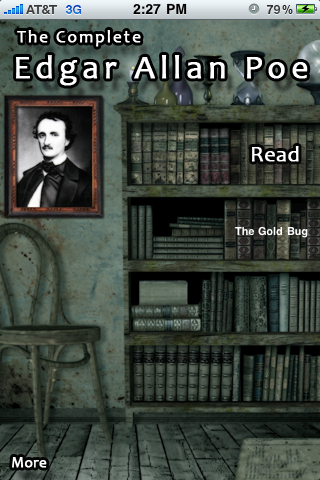 The Complete Edgar Allan Poe for iPhone and iPod touch 1.0 is only $0.99 (USD) and available worldwide exclusively through the App Store in the Books category. Review copies are available upon request. All future updates, including story and sound additions, are included with initial purchase. iPad Compatible, Optimized iPad version also separately available.